Choosing the most outrageous setting for your Shakespeare production has been all the rage for a while. You could see a post-apocalyptic, drug-addicted Hamlet who lived on the moon one night, A Midsummer Night's Dream with zombies in a swamp the next, and on the third, visit a banana republic Julius Caesar where Caesar bore a distinct resemblance to Juan Peron. These creative staging ideas were intended to make the plays more accessible to modern audiences who could immediately recognize what it meant if Twelfth Night's Andrew Aguecheek and Toby Belch looked like Laurel and Hardy or Katherina and Petruchio pulled out six-shooters in the Wild West. The ideas are certainly creative, but when you see these productions, the basic question of whether it works remains. Is the setting a gimmick or does it actually illuminate something in the play? More recently, a new fashion in Shakespeare has emerged. Instead of sending Hamlet into outer space, companies are picking up on "Original Practices," where they attempt to recreate Shakespeare's plays as they were actually performed in Shakespeare's time. The idea seems to be to strip away modern contrivances and get back to Shakespeare the way Shakespeare intended. But once again, the question remains. Does it work? Is it a gimmick or does it illuminate the play? 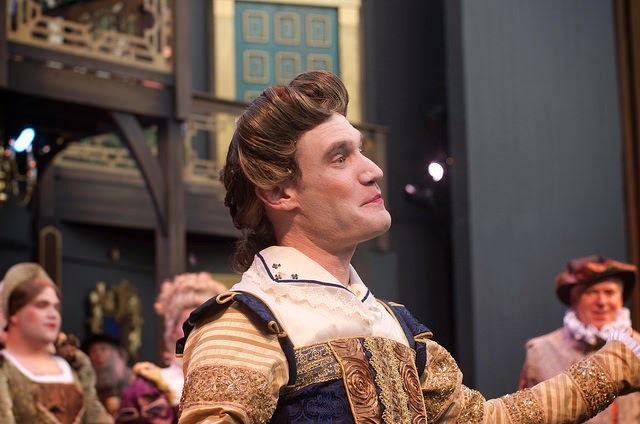 In this year's schedule of three mainstage plays at the Illinois Shakespeare Festival, Artistic Director Kevin Rich handed Much Ado About Nothing over to director Jonathan West with an eye on examining and experimenting with some pieces of the Original Practices pie. That means that in performance, you'll find Elizabethan costumes, on-stage music and lights, actors speaking directly to the audience, pillars that look a bit like those at the resurrected Globe Theatre in London, and... An all-male cast. This Much Ado goes with a Much A-Dude approach not only to adhere to Original Practices, but also to take advantage of playing in repertory with Timothy Findley's Elizabeth Rex, wherein the queen converses with members of Shakespeare's acting troupe, including the men who have just finished performing Much Ado for her. 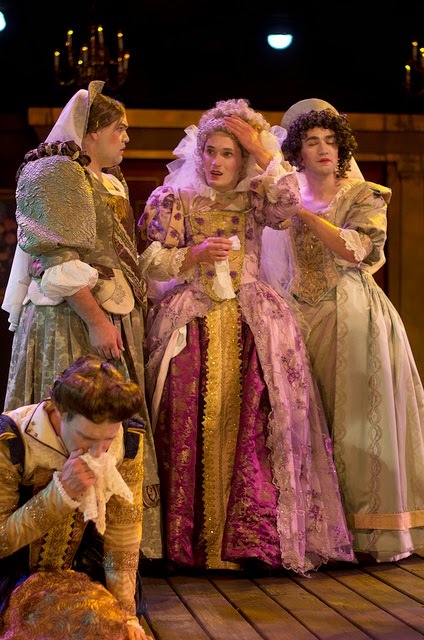 For the Illinois Shakespeare festival, the casts cross over between the two plays, with, for example, Christopher Prentice (seen below) taking both the role of the actor in Elizabeth Rex who plays Beatrice and Beatrice herself in Much Ado. It's an interesting experiment to use that kind of cross-pollination and to see what happens when a man plays a character like Beatrice, who defies gender stereotypes and even talks about wanting to be a man so that she can throttle feckless Claudio. But... It also denies an actress the chance to play this particular role, one of Shakespeare's best and brightest women. Director West has not gone for camp or over-the-top humor from the ungainly appearance of his "women," as you might experience in Tyler Perry movies or from other roles where men have famously played women, like Edna Turnblad in the musical Hairspray or even Lady Bracknell in The Importance of Being Earnest. Instead, West's actors, including Prentice as Beatrice, Colin Lawrence as Hero, Jack Dwyer as Margaret and Colin Trevino-Odell as Ursula, play it straight for the most part. Of the four men who cross gender lines, Colin Lawrence is the most successful at suggesting there is actually a female character in front of us. His Hero is sweet and giddy, with good energy and good humor. But in the role of Beatrice, half of the central romance, Prentice doesn't really come alive. He has a commanding physical presence and projects intelligence and strength, but none of the spark or charm necessary to create a memorable Beatrice. 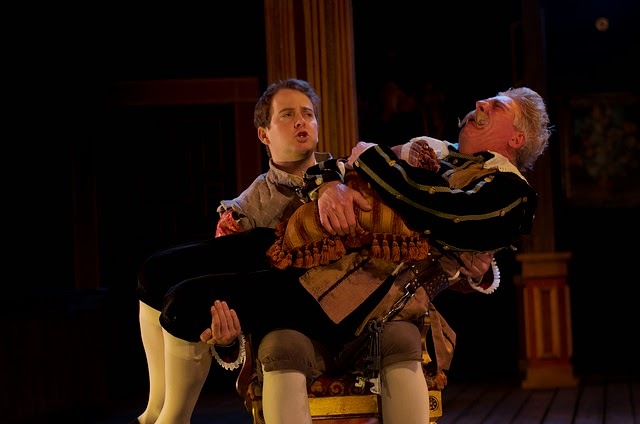 He also doesn't show much chemistry with Matt Daniels, who is otherwise a fine Benedick. It's telling that Benedick's gulling scene -- where a trio of men pull a fast one on him while he eavesdrops -- plays much better than the parallel Beatrice gulling scene, which gets bogged down by the gender switch. Joey Banks holds Norman Moses, as Dogberry, in his lap. Luckily, Dogberry, the bumbling constable who accidentally catches the bad guys and saves the day, emerges as a definite highlight in this production. Norman Moses gives Dogberry a Wizard of Oz flourish and enough comic tricks to make every appearance a delight. In the end, the Illinois Shakespeare Festival Much Ado About Nothing succeeds in looking different and raising questions about how and why we see Shakespeare as we see it. As a comedy, it also succeeds when Dogberry is on the scene. As a romantic comedy, however, it leaves a bit to be desired. Cast: Thomas Anthony Quinn, Matt Daniels, Michael Pine, Norman Moses, Todd Denning, Christopher Prentice, Colin Lawrence, Phillip Ray Guevara, Ron Roman, Joey Banks, Jack Dwyer, Colin Trevino-Odell, Fredric Stone, Timuchin Aker, Wigasi Bryant, Robert Michael Johnson, Adrienne Boni, Michelle Plunkett, Pamela Schuett. Remaining performances: July 17, 19, 22, 25, 27 and 30; August 2, 3, 5, 7 and 9. Note: The Illinois Shakespeare Festival provided a press ticket and asked me to review a preview performance of this production of Much Ado About Nothing.